Our Secondary Glazing System enables you to keep the original character of your home, office or factory, whilst vastly improving your living or working environment by reducing noise pollution and increased security. Below are three facts with diagrams, this shows you how our system is more efficient than other systems. All our secondary glazing systems are designed and built with one goal in mind - that they should be the best. Each new design is rigorously tested by scientists who try and find as many weaknesses in our windows as they can. Only when we're satisfied that they've achieved maximum efficiency, do we introduce them to you. We pride ourselves on our window's ability to deal with all kinds of noise pollution. 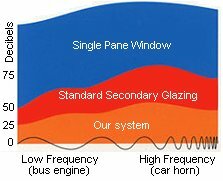 Different sounds penetrate glass in varying ways. Noise reduction can be approached in a number of different ways depending on the noise that needs to be reduced. The low frequency of a lorry engine behaves differently to the whine of a high frequency motorbike. Thanks to laboratory testing, we can prove that our systems keep out more noise pollution than a standard secondary glazing installation. All windows lose heat to some extent. 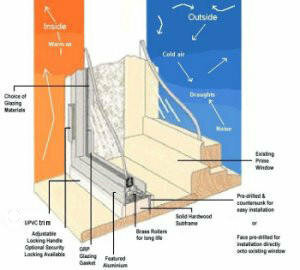 Secondary glazing simply puts an additional barrier in place to prevent heat escaping. Our systems are simply more efficient than others at doing just that!